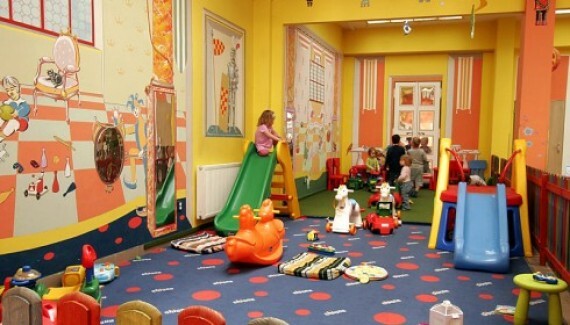 I went all the way to Palmovka to see this restaurant with its big Indoor Playground as they were promoting on the web. I was not expecting it to be such a large restaurant. 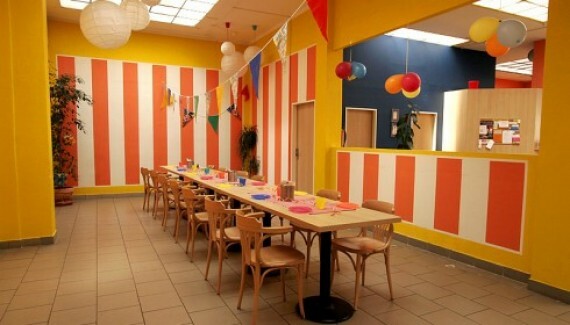 From what we experienced this would be an ideal place for a Kids Birthday Party or any party with involving many kids. This restaurant has 2 big sections and the one with the Playground is the biggest one. The playground is clean, large with lots of light and as as a bonus they have a Golf Simulator. The kids can safely play, Moms can happily chat and the Dads can play Golf. Sounds like a plan ! The restaurant is called: “U Divadla”. Divadlo means Theatre in Czech and U means “by”. Its all because the Pizzeria is right next to the Palmovka Theatre. This part of Prague is a bit distant for me and I don’t know it that well. What helped a lot was that the Restaurant is on the same street, like 30m away from the Palmovka Metro stop. The Metro station has 2 different exists so take the one towards ZENKLOVA street. It actually says it’s name on the direction board inside the Metro. Keep on walking down the main street away from Libensky Bridge and you will come right to it. The entrance to the part with Indoor Playground is actually around the corner from the other side of the building, but you can get there by walking through the whole restaurant to the back part. Don’t get confused, it’s there, right at the end pass the kitchen and the bar. If you live anywhere close by, you will appreciate it for sure. I wouldn’t come back just for the sake of the Indoor Playground but I thought it would be an excellent place for a child’s birthday party. It has 2 bars, one official one and one that can be used just for the party. The restaurant can be divided into different parts as well and the Indoor Playground has a fence so kids cannot run out. I had Spaghetti Bolognese which was nothing special, without a taste really. They claim their pasta is home made pasta but truly - I have had better home made spaghetti. I put lots of Parmesan over it and it was edible. The Pizza though was great !! big and tasty so you might like to stick to the Pizza if you go there. See, some may be put off the area, it’s not fancy. The truth is, when I walked into the restaurant - it looked like nothing special. It looked like a local, normal restaurant. Nothing fancy. The part with the Indoor playground is different though. They made an effort and had some artist paint its walls as a Libensky Castle. Outside and inside as it really nice. The rest of the walls are very positive as well and helps create a nice atmosphere. If you plan a Birthday Party you might like to check on their web page to see if they are not closed a private party on you preferred day - it’s always mentioned on the main page. They claim to make very good cakes and for a big party they widen their choice. I haven’t tried it as yet and they do not have pictures on the web. I am sure they will have some offer with pictures on the spot. DIRECTIONS: By Metro: Take the yellow C line to Station Palmovka. The Metro station has 2 different exists so take the one towards ZENKLOVA street. It actually says it’s name on the direction board inside Metro. Keep on walking on the main street until you pass by the Theatre. The restaurant is on the corner. By Tram: Take 8, 10, 24 or 25 to Tram Stop: Divadlo Pod Palmovkou, or Palmovka Tram stop. By Car: I am not sure, I went by Metro because I was afraid I will not be able to park close by. Keep on walking on the main street away form the Libensky bridge and you will come right to it.